I don't like superlatives in label info sheets, so when I read about epic masterpieces, Nordic proportions, Stockholm's heaviest and purest spirit of heavy metal, I take a step back and try to have a more objective look. 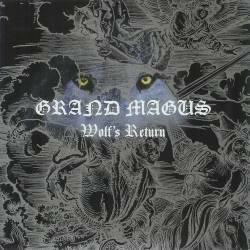 Grand Magus from Sweden are signed to Rise Above, implying that they are somewhat related to the doom genre, but their third album Wolf's Return is still mostly good old-schooled heavy metal. Singer and vocalist JB is also the singer of Swedish psyche-doom rockers Spiritual Beggars, where JB even hit once the top ten of best vocalist in a poll done by a Japanese rock magazine. So you can justly expect good vocals. What we slightly miss is originality, with a very good natured band playing all the tricks of the Seventies doom stoner metal school, but if I didn't know any better, I would feel compelled to say that this is a long lost Candlemass album, with less pathos and more balls though, which isn't a bad thing either. Wolf's Return needs some runnings to get stuck in your head, but then you will discover some truly grand songs like the opener Kingslayer, the two-parted title track and especially the driving Blood Oath. With one outro and three short instrumentals (with Swedish titles), we are left with only seven regular songs, adding up to a good half hour of heavy doom metal, ranging from dramatic slowness to grooving heavy metal headbangers. This is quite a short album that nevertheless should still appeal to fans of Northern doom heavy metal. The label's adjectives are certainly exaggerated, but Wolf's Blood should not disappoint.